Intex Mobile offers budget phones with some brilliant features in their smart phones. Intex Aqua i2 Plus smartphone is a new phone by Intex in Aqua series. The Intex Aqua i2 Plus is a handy and light phone. Its dimensions are 144.4*72.88*8.9 and 8.9mm thick, making it very handy to use and fit into your pockets. The Intex Aqua i2 Plus comes with a large TFT IPS display of 5 inch having a resolution of 480 x 854 pixels and 16M colors, making it good to enjoy crisp clarity videos. The i2 Plus runs on Android 4.2.2 Jelly Bean platform which can be upgraded later when the updates are available. This phone is powered by 1.2GHz Dual Core processor with MT6572 processor for ultra fast processing speeds, which makes it easier to open multiple apps at a time. Connectivity options featured in the Aqua i2 plus include Bluetooth, Wi-Fi, USB port, GPS/AGPS and EDGE. An additional feature in this phone is that it supports 3G, which is not available in most of the phones at this pricing. The Dual SIM option is present in this phone, making it easier to balance personal and professional life. It comes with pre-loaded games and applications. It also comes with various Intel apps like Intex Game club, Intex play and Intex cloud. The i2 also supports video calling. It has a slim design 5MP rear camera which supports attractive features like LED flash, autofocus and digital zoom along with a resolution of 3,264 x 2,448 pixels. It is accompanied by a 2MP front facing camera making it easier for your selfies and video calling. The phone has a 3.5mm audio jack, so that the songs can be enjoyed over earphones and on the speakers. The audio player supports MP3, MID, WAV, 3GPP and AMR formats. The supported video formats are MP4, 3GP, AVI and H264 (Mx player). The Intex Aqua i2 Plus has a RAM of 512MB and an internal storage memory of 4GB. The internal storage memory can be expanded up to 32GB with the micro SD card, which can be inserted into the memory slot. There is a 1700mAh Li-ion battery to keep running the show with a talk-time up to 5.6hrs and a standby time up to 212hrs. The Intex Aqua i2 Plus is an affordable Dual SIM smartphone designed to meet the expectations of the consumers. Fast processor, preloaded with applications and a good rear and front camera is a great buy at this price. 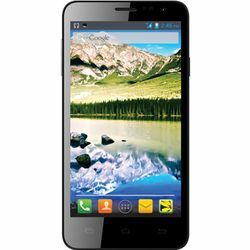 Intex Mobile offers budget phones with some brilliant features in their smart phones. Intex Aqua i2 Plus smartphone is a new phone by Intex in Aqua series.DESIGNThe Intex Aqua i2 Plus is a handy and light phone. Its dimensions are 144.4*72.88*8.9 and 8.9mm thick, making it very handy to use and fit into your pockets.DISPLAYThe Intex Aqua i2 Plus comes with a large TFT IPS display of 5 inch having a resolution of 480 x 854 pixels and 16M colors, making it good to enjoy crisp clarity videos.OS & PROCESSORThe i2 Plus runs on Android 4.2.2 Jelly Bean platform which can be upgraded later when the updates are available. This phone is powered by 1.2GHz Dual Core processor with MT6572 processor for ultra fast processing speeds, which makes it easier to open multiple apps at a time.CONNECTIVITYConnectivity options featured in the Aqua i2 plus include Bluetooth, Wi-Fi, USB port, GPS/AGPS and EDGE. An additional feature in this phone is that it supports 3G, which is not available in most of the phones at this pricing. The Dual SIM option is present in this phone, making it easier to balance personal and professional life.OTHER FEATURESIt comes with pre-loaded games and applications. It also comes with various Intel apps like Intex Game club, Intex play and Intex cloud. The i2 also supports video calling.CAMERAIt has a slim design 5MP rear camera which supports attractive features like LED flash, autofocus and digital zoom along with a resolution of 3,264 x 2,448 pixels. It is accompanied by a 2MP front facing camera making it easier for your selfies and video calling.MULTIMEDIAThe phone has a 3.5mm audio jack, so that the songs can be enjoyed over earphones and on the speakers. The audio player supports MP3, MID, WAV, 3GPP and AMR formats. The supported video formats are MP4, 3GP, AVI and H264 (Mx player).MEMORY & BATTERYThe Intex Aqua i2 Plus has a RAM of 512MB and an internal storage memory of 4GB. The internal storage memory can be expanded up to 32GB with the micro SD card, which can be inserted into the memory slot. There is a 1700mAh Li-ion battery to keep running the show with a talk-time up to 5.6hrs and a standby time up to 212hrs.The Intex Aqua i2 Plus is an affordable Dual SIM smartphone designed to meet the expectations of the consumers. Fast processor, preloaded with applications and a good rear and front camera is a great buy at this price.